France invented the hôtel and still boasts some of the best in the world, but you can also find good budget rooms, or just a bed—or an apartment/flat. Hôtel: the word is French, after all! You'll find every sort of hotel in France, from modern, efficient, inexpensive lodgings at Charles de Gaulle Airport to luxury châteaux on the Loire. You will always find a few hotels near the train station in any French city and in larger towns, and there are usually several modern budget-to-moderate-price hotels near important highway interchanges. Almost all taxes and service charges are included in the room price quoted to you. With one exception, they will not be added to your bill at the end of your stay, jacking up your out-of-pocket cost, as is the custom in some countries (such as the USA). The one exception is a small taxe de séjour, a few euros imposed by some towns and villages. Breakfast is not normally included in the price of your room, though some hotels may include it, or require you to purchase it (at a relatively high price), especially during the high summer tourism season. Most hotels and other accommodations provide Wifi, usually free, except at the most expensive hotels. Modern hotels out of city centers usually provide ample parking, sometimes covered, often at no additional charge. However, traditional hotels in historic city centers may have no parking facilities, or may have only a few spaces, for which a fee is charged. You should ask about parking when you make your hotel reservations. Every French city, town and village provides parking lots, sometimes free, sometimes subject to a fee. All are indicated by efficient signage systems, so you can easily follow signs from when approach the town right to a parking lot. 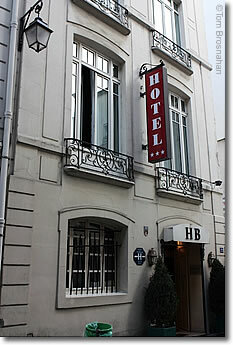 Except for the modern chain hotels (see below), French hotels tend to be in older buildings adapted to the needs of modern travelers. Rooms and facilities are not standardized, so size, comfort, noise, bathroom facilities, heating and cooling, furniture and décor vary (perhaps greatly) from room to room. In a small 20-room hotel there may be tiny rooms as well as large suites, views of distant mountains or of a cramped air-shaft. If you don't like the room assigned to you, ask to see others that are available. Youth and traveler hostels are well located and affordable. You can even rent just a bed. Flats/apartments to let number in the hundreds. Finding a hotel near Paris-Charles de Gaulle Airport can be very confusing, so I've figured it all out for you. Here's all the information. in the central Marais district of Paris. 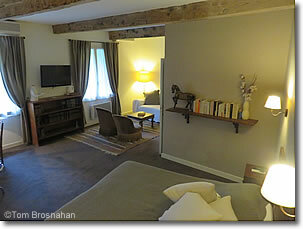 Comfortable junior suite at the 3-star Hôtel Lou Cigaloun in Orange, Provence, France.